You can choose to stub only email over a certain age. This means that the less used, older, email can be stubbed but the more current email is left untouched. You can choose to stub only email over a certain size. This means that the smaller email that has little impact on Exchange storage can stay in Exchange. 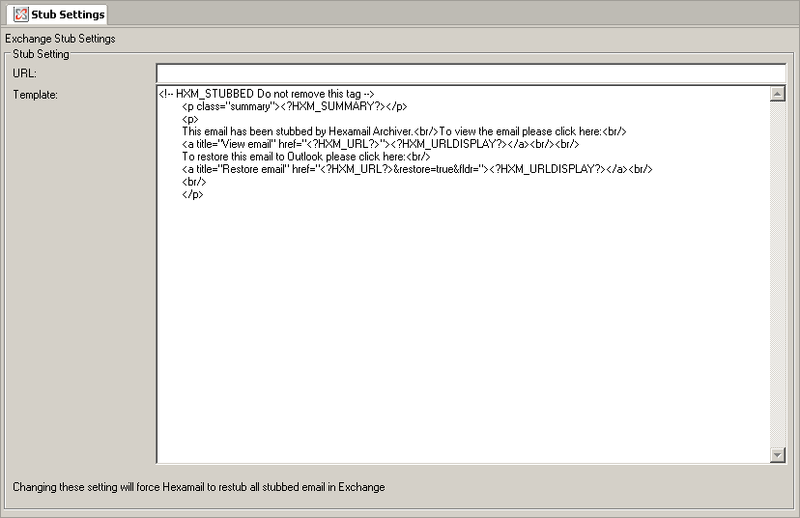 Large email can be stubbed to remove the storage overhead in Exchange. This list allows the configuration of mailbox matching expressions. When an expression matches it will perform the action specified for the expression. The expression type shows the type of expression the matching engine will use for the entered expression. Mailboxes that match Include items will be included when the importer is importing email from the chosen source. Mailboxes that match Exclude items will not be included when the importer is importing email from the chosen source. sub(mail) matches the phrase "Hexamail produces server software"
SUB(mail) does not match the phrase "HexaMail produces server software"
cmp(mail) matches ONLY the entire exact string "mAil"
" match " or "word(match)"
word(mail) does not match the phrase "Hexamail produces server software" but does match the phrase "Hexamail produces mail server software"
WORD(Mail) does not match the phrase "Hexamail produces mail server software" but does match the phrase "Mail server software produced by Hexamail"
Example wild(*v?agra*) matches the phrase "Hexamail does not ship v1agra"
the * wrappers round wildcard expressions, you can also do wild(Start*) to match the phrase "Start of the content" but not match "the content starts here"
WILD(*v?agra*) does not match the phrase "Hexamail does not ship V1agra"
the * wrappers round wildcard expressions, you can also do WILD(*End) to match the phrase "The content End" but not match "the content ends here"
BOOL(wild(*viagra*) AND wild(*ph?rm?cy*) must match both wild matches to be considered an overall match. Brackets may be used. This list allows the configuration of sender matching expressions. When an expression matches it will perform the action specified for the expression. The expression type shows the type of expression the expression matching engine will use for the entered expression. The default is a case-insensitive substring match. Under Exchange 2007 onwards folders should be of the form Archive, or Archive/ Exchange 2007 onwards do not support wildcards within foldernames, only to specify including all subfolders. Exchange 2007 onwards also does not support substring matches so any substring matches will be considered as exact matches You need to add Archive and Archive/ to specify including the folder Archive and all those below it. Stubbing can truncate and summarize the email content as well as removing attachments. Use this setting to truncate the text or html content. The URL you wish to send to users for them to access the web interface. The URL sent to users should correspond to the host and port setup for the web interface. If for example you have set the Port to 8080 and the host is left blank (to bind to all/default NICs), then the URL should be http://hostmachinename:8080 Remember that if external users are to manage their own SPAM then the URL specified must be accessible from outside your local network, and your firewall must be configured to allow incoming TCP (HTTP) connections to this machine on the chosen port. If you leave this setting blank, a URL will be automatically constructed from the machine's hostname and configured port. In some cases this will not be accessible by users outside of your local network, so you will need to specify this if sending alert emails to users external to your network. You can customize the stub template used with this editor. Changing this setting will force Hexamail to restub all stubbed email in Exchange.